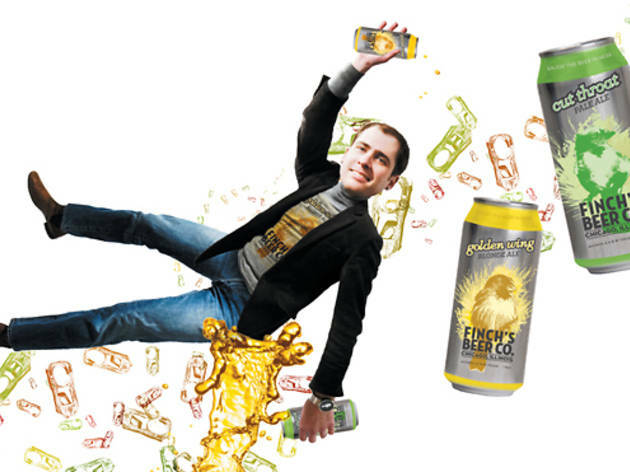 For marketing wunderkind Ben Finch, his brewery's brand is just as important as the brew itself. “We. Will. We. Will. Rock you.” The Queen classic streams out of computer speakers on one of a dozen desks at Killswitch Collective. The mod workspace is obscured by an artfully angled lime-green wall, a barrier between Ashland Avenue and the tech-savvy hipsters turning the wheels at this West Town creative agency. A mountain of boots and Converse shoes sits at the entrance, while graphic designers, Web developers and branding gurus run around sock-footed, figuring out a way to deliver “cool” to clients like Puma and MTV. Killswitch CEO Ben Finch, 31, blends in like an indie rocker in a Pitchfork crowd, but when the hoodie-wearing kids behind the computers finish designing their Jackass logo for the day and go home, Finch remains, in constant R&D mode, compiling market statistics for what’s selling and who’s buying it, continuing to grow the $2.5 million company he and co-owner Meredith Martin founded in 2004. Pretty good, indeed. While U.S. beer sales were down about 3 percent overall in 2010, it was the big boys taking the hit. According to the Brewers Association, an industry leader in tracking statistics, the craft-brewing segment (small, independently owned breweries producing fewer than 6 million barrels a year) grew by 9 percent in 2010, up from 7.2 percent growth in 2009 and 5.9 percent in 2008. Craft brewing accounts for only about $7 billion in an industry worth approximately $100 billion, but it’s the sole portion of the business showing continual growth. And with imported beer sales down by about 10 percent in 2010, there’s a strong sign people are looking to drink local, or at least that’s the hope of new entrants like Finch, whose dad helped finance the beer business.